I'm a little bit chuffed to say... I finished a quilt. Sure it's teeny tiny, but still it is a quilt and it is finished! Ok, perhaps I am a little too excited. 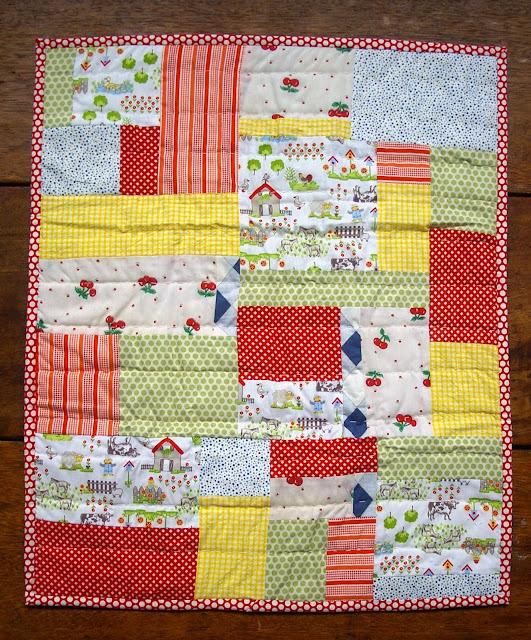 I've named it "The Happy Farmer" and it's waiting patiently to be be joined by two more teeny quilts. And then... when I get around to it, they'll be heading to the shop. 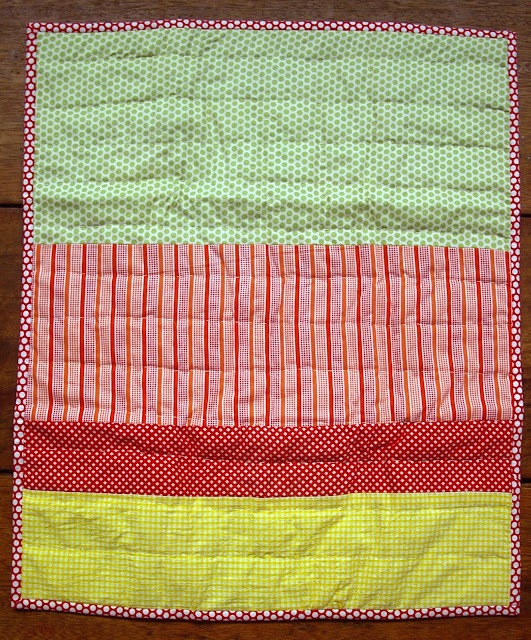 At just a wee 55cm x 60cm, it's the perfect size to pop over a wee baby in the pram or capsule. It's been lovingly (ie: wonkily) handquilted and features a variety of vintage and new fabrics. The cute farm fabric was brought back from Paris by my sweet sister. The days have been slow around these parts. We're storing our energy for another hectic weekend ahead. There's a house to inspect, scrap metal to be collected, furniture to be delivered... a big long rattling list really, that I'm trying not to think about too much. Today is all about the home. We've rearranged Huckle's room to include a big bed (that he will hopefully soon sleep in), bread is in the oven and washing is swishing away in the machine. Aaah, domestic bliss (humour me here). Now for a cup of tea. What's afoot in your neck of the woods today? Whatever it is... enjoy it. Joining this group of crafty foxes. How lovely. You know what they say about small packages. the farm fabric is just too sweet. What a sweet quilt! I really like it. Well done to you! it looks lovely.